References to M*A*S*H have found their way into various other types of media, ranging from other television series to movies to songs, thanks to the impact the show left on the collective consciousness of all who watched it. What follows is a list of TV shows that mention M*A*S*H in some capacity, be it a quick throwaway line or a full-on parody. Submitted by chrissie: In an episode entitled “Stale Mates” Archie is reading the National Enquirer and on the cover you can see a picture of Jamie Farr and some women. M*A*S*H are shown during a scene in which a fake infomercial is shown. As the episode cuts to a fake video sharing website called YourClipz.com, a second or two of the closing theme can be heard and the final frame of the closing credits from “George” is shown. A number of characters on the show are named George so this episode was obviously chosen for a reason. After Abed’s advice works out, Jeff thanks Abed by calling him Radar (Abed responds by saying “You made me so happy I just peed a little.”). 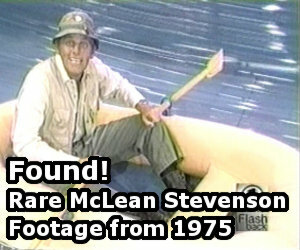 The episode ends with a freeze frame, the closing theme from M*A*S*H and fake credits matching those from the series. M*A*S*H Reference on Community – Copyright © Sony Pictures Television Inc. In one episode, when Drew is having flashbacks to his high school years, the 1972 or 1976 flashback starts with the M*A*S*H theme playing. In one episode, Brian comes into a room with a surgical mask, parodying the scene in “Abyssinia, Henry” when Radar comes into the OR to tell of Henry’s death. Submitted by Sarah and Frogz: During the Sunday, October 7th, 2007 episode titled “Believe It Or Not Joe’s Walking On Air,” the character of Joe (a police officer in a wheelchair) is about to undergo a leg transplant. The doctor puts on an informational video and Jamie Farr appears on the television set. He says, “Hi, I’m Jamie Farr, and you’re about to perform leg surgery.” Joe attempts to protest, but he was given anesthesia earlier and passed out. M*A*S*H. Martin says Hawkeye reminds him of himself, and Daphne replies that she sees him as more of a Colonel Potter type. Martin gets annoyed, and they argue until Daphne gives in and pretends to agree with him. M*A*S*H is funny. Then one of them tells the others that Radar “always carries a clipboard” because two of his fingers are shorter than normal, and the others act impressed. M*A*S*H plays, and one of the robotic doctors is called iHawk (obviously based on Hawkeye) and has a switch that goes from Irreverent and Maudlin. M*A*S*H to come in and do the lines for the announcements in the episode. In one episode, Lorelei is helping her father out by acting as his secretary for a few days, and her father comments that she is “just like that short fellow on M*A*S*H, always anticipating things,” or something to that effect. In the episode “We’ve Got Magic to Do,” while organizing a Daughters of the Revolution party, Rory calls her assistant Radar and asks if she hears helicopters coming. Later, the same assistant finally gets the joke. M*A*S*H when Major Burns wants a discharge for a soldier because he is gay. The March 25th, 2010 episode was titled “Suicide is Painless,” a clear reference to the memorable theme song from the film MASH and M*A*S*H the TV series. During the February 22nd, 2012 episode, “The Butterfly Effect Effect,” Alex (played by Elisha Cuthbert) is overly excited about having a sleepover: “Yes! A slumber party. We’ll order pizza, have strawberry milk. We’ll play MASH. I get to be Hawkeye.” This refers both to M*A*S*H the TV show and MASH the children’s game. In “The Bracket” (originally broadcast March 31st, 2008) during a flashback scene Barney (Neil Patrick Harris) is trying to remember the name of the actor who played Hawkeye on M*A*S*H. Lily (Alyson Hannigan) suggests Alan Alda. Barney says no and heads for the bar. When he returns, he says it was Alan Alda. M*A*S*H* marathon and says something like “Oh, this is the episode where Hawkeye and Hot Lips kiss.” Also in the same episode (or another one, I saw it a long time ago) William Christopher was playing a priest, and at the end during the credits was complaining that he always plays a priest and that he can be a tough guy too. In one episode, Francis talks about how he’d rather have Hawkeye operate on him over Trapper John. Various episodes of this series had comments about characters from M*A*S*H.
In one episode, the character of Dave Nelson says “Hey, I didn’t just sign for a stolen jeep, did I Radar?”, referencing the way Radar would trick whoever is his CO into signing for odd things. In the episode “Rapunzel, Rapunzel” (originally broadcast December 6th, 2016), Chanel (played by Emma Roberts) doesn’t know that M*A*S*H is a TV show. When told by Dr. Brock Holt (played by John Stamos) that M*A*S*H is “only the most popular television show in the history of TV,” she insists Boy Meets World is in fact the most popular TV show ever. Submitted by Cathy W.: In the episode “My Super Ego” (originally broadcast November 6th, 2001) J.D. mentions playing M*A*S*H with his older brother. Then he flashes back to when he was a kid, and he has a blond wig on. He complains, “I don’t want to be Hot Lips again.” Then his brother’s voice, off-camera, says, “Shut up and kiss Frank.” The dog, presumably “Frank,” has a green Army-issue hat on. Submitted by Chloe: Big Bird’s teddy bear is named Radar. In one episode, Dr. Mark Craig mentions his friend Dr. B.J. Hunnicut to his wife. Submitted by Jan: In the last episode there was a patient #4077 named Colonel Henry Blake who was injured in a helicopter crash. In one episode, in a wax museum that had melted, the sign the stood at the entrance to the camp, “M*A*S*H Best Care Anywhere”, can be seen, as can puddles of melted wax that no doubt were once characters from the show. Woman 1: That Mike Farrell really boils my potato. Woman 2: I miss the Klinger already. M*A*S*H played, Dr. Hibbert was seen kneeling amongst a field filled with sick students laid out on stretchers. There was even a close-up of Dr. Hibbert, mimicking the close-up of Hawkeye in the opening credits. Dr. Hibbert helps load a sick student onto a helicopter, which was actually part of a helicopter carnival ride. Submitted by Lisa: The sergeant responsible for opening the stargate for most of the 10-year run of the series was given the name Walter, in honor of Radar. An interview with Eclipse Magazine confirms this. In the episode “Half A Life”, which guest-starred David Ogden Stiers, his character was utilizing a computer terminal, the number of which was #4077. In the pilot episode, during a hostage situation in a coffee shop, a cell phone begins ringing; its ring tone is the theme to M*A*S*H.
M*A*S*H, however, he decides to switch to the Girls Team. M*A*S*H would be ending, and he became upset over the show ending. Submitted by Ali: In one episode, Greg is giving Jimmy a long explanation and Jimmy starts day dreaming. He day dreams this: “I like grape soda. Radar liked grape soda. They need to have more M*A*S*H references on TV! Pinky and the brain also refers to Klinger in one episode. There was a reference to M*A*S*H on yesterday’s Pointless (very good BBC quiz). The contestants had to match the name of the hospital to the TV show it featured it. 4077 Mobile Army Surgical Hospital was one of the clues. Another MASH reference on Pointless today. Contestants had to match TV doctors to the show they were on. One of the clues was Benjamin “Hawkeye” Pierce. The contestant guesses correctly and the host mentioned how Alan Alda was the only actor to appear in every episode and how the last episode was the most watched show ever. MASH on TV references: Family Guy in the episode “I Take Thee Quagmire” when Peter says to Quagmire he’s going all “sissy-boy Alan Alda”. In the popular Canadian sitcom Corner Gas, M*A*S*H is mentioned in the episode Tax Man when Brent says to Hank his plan is similar to blackmail plots in M*A*S*H.
On one episode of Benson in the early 80’s, Benson was discussing the fact that he was a Korean War veteran, and he didn’t like to remember it. Benson said “I don’t even watch MASH”.